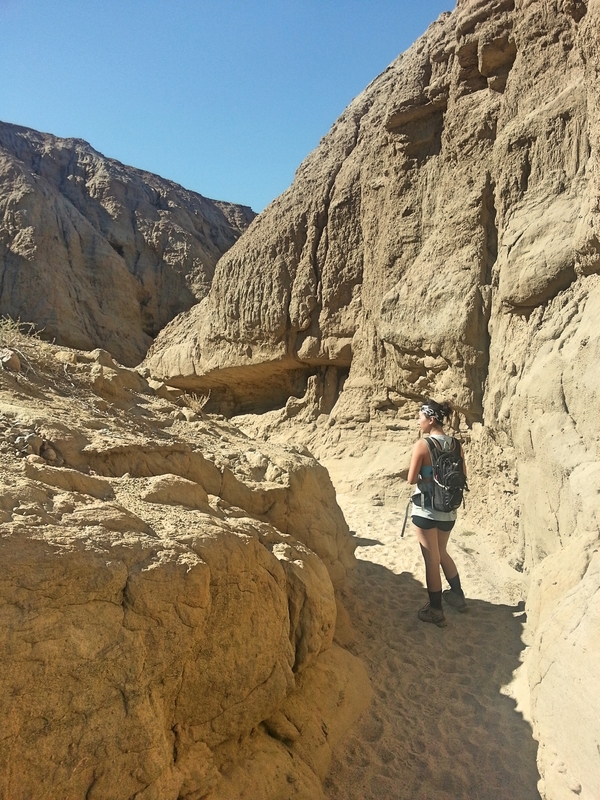 One of the more popular attractions in Anza-Borrego, the Slot is easy to get to (even in 2WD), an easy and short hike, and makes for great photographs. The steep walls provide some relief from the hot sun (even in February! ), and kids will love exploring this maze. Instead of taking the main paved Highway 78 from FishCreek Campground, we decided to take Old Kane Spring Road, a parallel dirt road market on our map. It was all fine in our 2WD Tacoma truck until the road began to have large portions of very rocky patches. Making our way very carefully and slowly, we finally made it out onto the 78! It was quite the off-roading adventure. We popped out right in front of Buttes Pass Road, a dirt road off the 78, and continued on it towards the TH. When you reach a junction in the dirt road, be sure to take the left one. It'll continue on a pretty well maintained dirt road until you reach a visible parking area. There were lots of cars and groups of people getting ready to hike, so we tried to hurry and beat them in. Luckily, we overheard some of the hikers who just came out giving the others tips about where to enter. Even though the dirt trail continues up several hills, you want to only hike over the first small hill and then start to descend into the canyon. 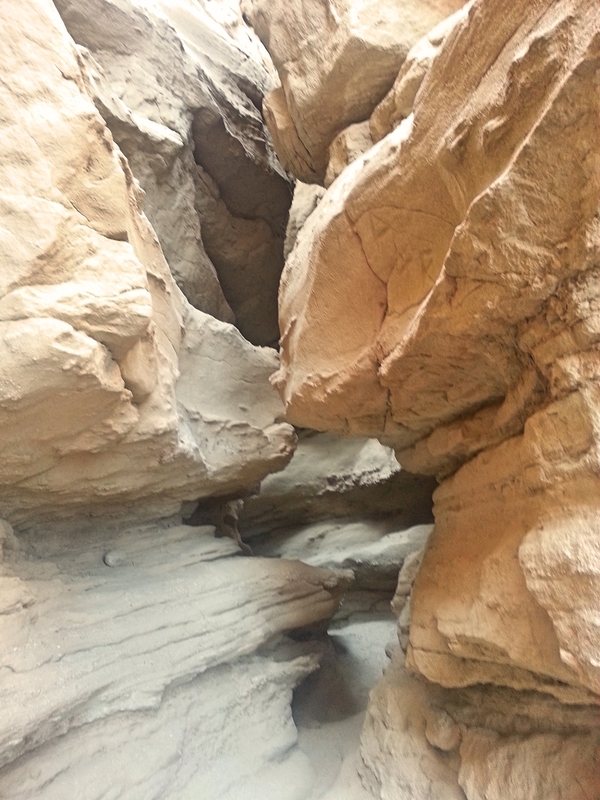 In the picture below, the correct canyon is the one closest to the parking area. Walls begin to rise and narrow in on you the more you hike in. Instead of hiking all the way back to the TH, we decided to climb out since we have so much canyon climbing experience from the day before. 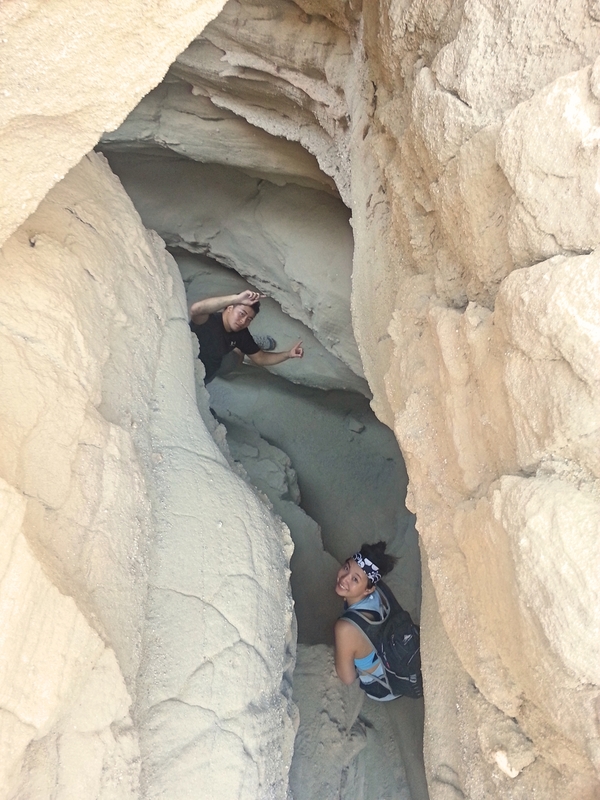 We follow up a mini wash up the canyon wall closest to the parking lot, with the portion closest to the top being the most difficult due to the steepness and the crumbly rock. We emerged at the top feeling triumphant and got to view what we just hiked through from above. After we changed out of our dusty boots, we got back into the truck to continue towards Borrego Springs. 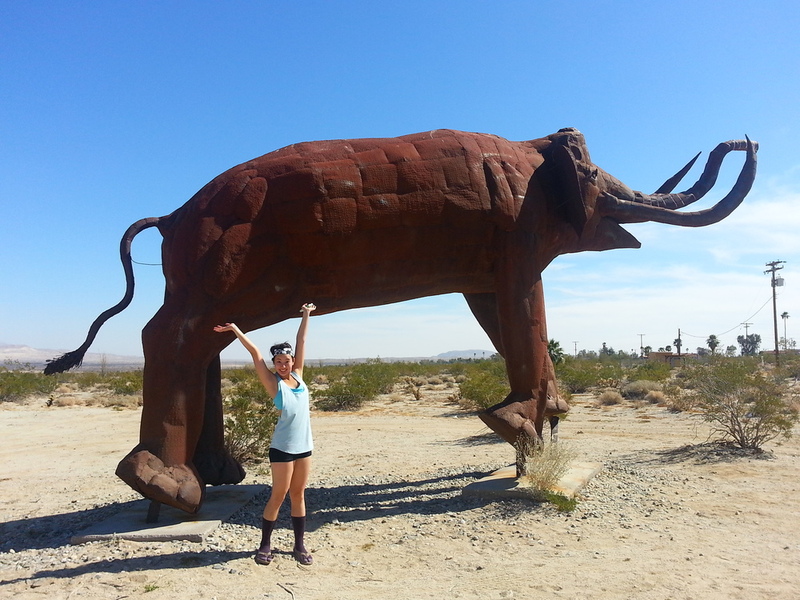 On the way we passed several giant metal art sculptures visible from Borrego Springs Rd.